In 1954 Rosa María Plasencia’s father came to live in what’s now the famous lobster village of Puerto Nuevo. He came because he’d heard there were lobsters there lots of them. There were. A year later Rosa María’s mother’s family came. The two young people met, fell in love, married and built a tiny house across the street from what is now the family restaurant, Puerto Nuevo II. At that time there were only two or three families living on the cliffs overlooking the Pacific. Every day the men went out to sea in their pangas. Every afternoon their wives would scan the waters until they saw their husbands’ boats materialize on the horizon. Once a positive sighting was made, they’d rush to heat up beans and rice, pound out some fresh tortillas and put a kettle of lard on the fire. The men always came back ravenous, and when they unloaded their catch of lobsters, they’d slice a few in half, drop them into the bubbling lard and fry them up. There was no refrigeration back then, so the now-famous meal of fresh fried lobster, beans, rice and tortillas came into being purely out of necessity. The sea provided the lobsters. Beans and rice didn’t need to be refrigerated, and the tortillas could be made on the spot. Even to this day, Rosa María and her husband, Enrique Murillo eats mayonnaise with their lobster instead of melted butter. Why? Because that’s what was served when they were growing up, and they like it. Occasionally some Americans would show up and ask the men to take them fishing in their pangas. When they came back in, they’d join the Mexicans in a big meal. As is typical still today at fish camps up and down Baja, no money ever changed hands. The Americans gave soda, ham, sandwiches, cookies, candy and whatever else they had to spare in return for the fine food. In about 1956, Rosa María’s father sent to Guadalajara for his brother and sister. They came and joined in the fishing and cooking. A few more families migrated to the area. One built a little stand next to the bus stop, where the welcoming arches are now. They sold sodas, snacks and burritos. Next to their stand was a billboard advertising New Port cigarettes. The Americans named the village after that sign, which, translated into Spanish is Puerto Nuevo! Over the years more and more people came from central Mexico. Some were intent on making their way to the USA, but stayed to fish and serve lobsters to the ever-growing crowds of visitors. A political activist, Señora Rentería, helped the families in Puerto Nuevo to get a grant from the government so they could have additional land to build on. She succeeded in getting 17 plots of land assigned to the locals and in gratitude for this; they named the village’s main street after her. 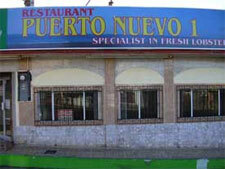 Restaurant Puerto Nuevo I founded by Rosa María’s aunt and stepfather was built on the first lot assigned. Puerto Nuevo II was built on the second lot, and got its name because of it. A third family built yet another restaurant. All of them charged about 50 cents for a lobster dinner back then. According to Enrique Murillo, people didn’t just order a dinner apiece. They came in large groups and ordered lobsters by the half or full dozen. They picked the live lobsters out themselves and watched, as they were sliced open and cooked in sizzling lard. Even though their husbands have passed on, all three ladies who helped found the first three restaurants are still alive today to witness their thriving village with its current total of 34 restaurants. A major growth spurt occurred in Puerto Nuevo in the ‘70s when the Ortega family came to town and built four restaurants, which they publicized widely. The signs for all the Ortega’s are easily visible from the toll road and these days, three to four thousand people make the trip to Puerto Nuevo to enjoy lobster dinners each week. Some come after a shopping trip to Rosarito, others on their way to or from Ensenada, some come on their way to or from southern Baja, but most come just for the food. There are several upscale hotels nearby now. There are plenty of shops too, where visitors can buy souvenirs from their visit to Mexico’s most famous lobster village. A few months ago, representatives from one of Mexico City’s most renowned restaurants, Hacienda de los Morales, came to visit Enrique Murillo and Rosa María Plasencia. This is a restaurant where presidents dine and governor’s daughters get married. The owners flew the Murillos to Mexico City and had Rosa María teach their chefs how to prepare lobster, rice, beans and even tortillas Puerto Nuevo style. They convinced her to pass on the secret recipe for her legendary smoked marlin with mushrooms and chipotle sauce. Hacienda de los Morales anticipated selling about 50 lobster dinners a day when they introduced them onto their menu, but at last check they were selling upwards of 80! That would indicate, it seems, that Puerto Nuevo has become famous, not just with locals and American tourists, but on a national level within Mexico. It’s a fame that’s well deserved and hard earned, just as Puerto Nuevo is a place not to be overlooked by travelers heading down the road to Ensenada. Get a FREE quote and print your Mexico Auto Insurance policy in minutes, completely eliminating the hassle of stopping at the border. Baja Surfing offers good surf and fun times. Get up to date swell and surf conditions for surf breaks in Baja California.